My theory: there are 3 types of tea drinkers (for pleasure, for some health benefit, to save the world/become one with the universe). You may think of some more, but I think this pretty much covers the spectrum. Most tea drinkers are a blend of one or more of these types, at least so far I have not met any purists (all one type or the other). Time to elaborate. 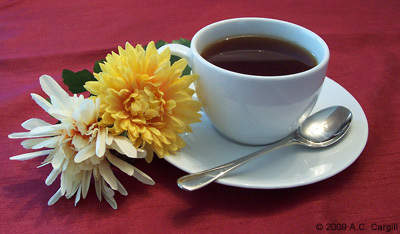 Many of us truly love the flavor of tea in all its variations, with our without anything added, hot or iced. Starting the day without that morning cuppa, be it English Breakfast, Tie Guan Yin, or even Matcha, would be incomprehensible. The sheer joy of the aromas and flavors make that day start out right. And then there is that Elevenses tea time and Afternoon Tea – moments that the pleasure drinker looks forward to for its sensory delights. Tea has a long list of health benefits associated with it. Many are supported by actual controlled studies while others come from centuries of anecdotal evidence. People, hopefully with the approval of their doctors, imbibe various styles of teas to take advantage of those benefits, which range from healthy skin and hair to preventing cancer (sadly, a recent study has shown that tea doesn’t cure cancer once it has begun). Along the way, many become tea aficionados and expand their range of sipping pleasure. No matter which of the above you are (and most of you will be a combination of two or more of the above), I wish you happy tea drinking.